Prabhjot Singh, a professor at Columbia University, sustained serious injuries after being subjected to a brutal hate crime attack. In a blog about the incident, his friend Simran Jeet Singh said that “Prabhjot has dedicated his life to serving the underserved,” as Director of Systems Management at the Earth Institute as well as within his local Harlem community. Valarie Kaur is a longtime advocate, writer, filmmaker, and activist for causes of justice that go far beyond the Sikh community. Her documentary Divided We Fall covered post-9/11 hate crimes and inspired a grassroots national dialogue. She also created a short film about the Sikh community in the aftermath of the horrific Oak Creek massacre. She’s currently at Auburn Theological seminary as the director of Groundswell, an initiative to empower the multifaith movement for justice. Waris Ahluwahlia is a talented jewelry designer known for his impeccable sense of style and beautiful creations. He acted in Wes Anderson’s film The Life Aquatic with Steve Zissou, and lately garnered praise for appearing in a Gap ad campaign with artist and film-maker Quentin Jones. The ad quickly went viral when someone vandalized it with bigoted graffiti, causing Gap to change its Twitter background to the picture of Ahluwahlia in a show of solidarity. 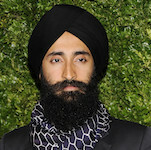 The incident showed the importance of mainstream media representation for minority communities as many Sikhs expressed their appreciation for Gap. Amrit Singh is a civil rights lawyer known for being one of the fiercest U.S. critics of the torture and abuse of prisoners under the Bush administration. 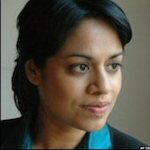 Her report, Globalizing Torture: CIA Secret Detention and Extraordinary Rendition, is considered the most comprehensive account to date of human rights abuses associated with secret detentions. 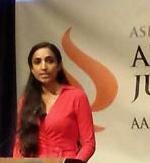 She is the senior legal officer for national security and counterterrorism at the Open Society Justice Initiative. 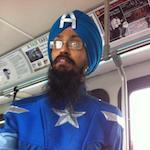 Vishavjit Singh drew smiles and laughs when he dressed up as Captain America and roamed the streets of New York. The cartoonist of Sikhtoons.com challenged expectations about superheroes and national entity with his awesome costume. Balpreet Kaur was named Huffington Post’s ‘Person Of The Year’ In 2012 for her amazing and thoughtful response to a Redditor who posted a picture of her online in order to make fun of her appearance. Her comments caused the original poster to have a total change of heart and publicly apologize. Yes, I’m a baptized Sikh woman with facial hair. Yes, I realize that my gender is often confused and I look different than most women. 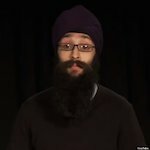 However, baptized Sikhs believe in the sacredness of this body – it is a gift that has been given to us by the Divine Being [which is genderless, actually] and, must keep it intact as a submission to the divine will… When I die, no one is going to remember what I looked like, heck, my kids will forget my voice, and slowly, all physical memory will fade away. However, my impact and legacy will remain: and, by not focusing on the physical beauty, I have time to cultivate those inner virtues and hopefully, focus my life on creating change and progress for this world in any way I can. 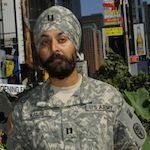 In 2009, Kamaljeet Singh Kalsi became the first Sikh allowed to serve on active duty in the U.S. army with a turban, beard and unshorn hair in more than twenty years. The emergency room doctor petitioned Congress for two years before the Army allowed him a religious exemption. Now, he hopes to rescind the strict rules that prevent some observant Sikhs from serving, as not all of them are granted religious exemptions like Kalsi. 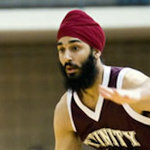 Darsh Singh is the NCAA’s first turbaned Sikh American basketball player. He ended his senior year at Trinity University as co-captain of the team.